There is no doubt that information technology has replaced human labor and increased productivity in many areas including both individual life and corporate operational activities. Technology enables us to manage things easily. Enterprise Resource Planning is a good example of how information technology is applied to business operation and increased efficiency in corporate activities. SAP uses the latest information technologies to develop the state of the art business solutions for major firms. In this regards, The Kookmin Review met one of our alumni, Kenneth Lee, an international business solution specialist. He is a senior specialist, in a multinational business solution vendor. In the interview, the Review asked him questions that were requested by students who were interested in both a foreign multinational company and a business solution vendor. I’m Kenneth Lee, Senior Presales Specialist. I’m currently working in a multinational company called SAP KOREA. 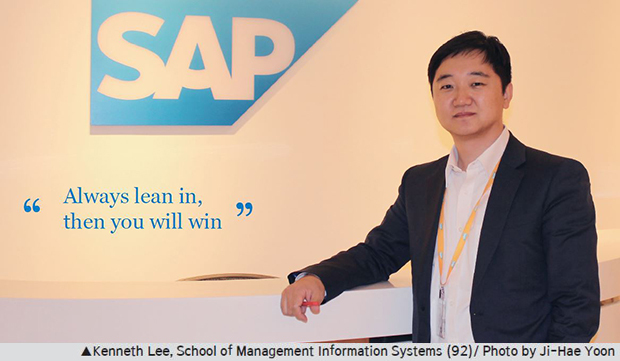 SAP KOREA is in charge of making enterprise software to manage business operations and customer relations. 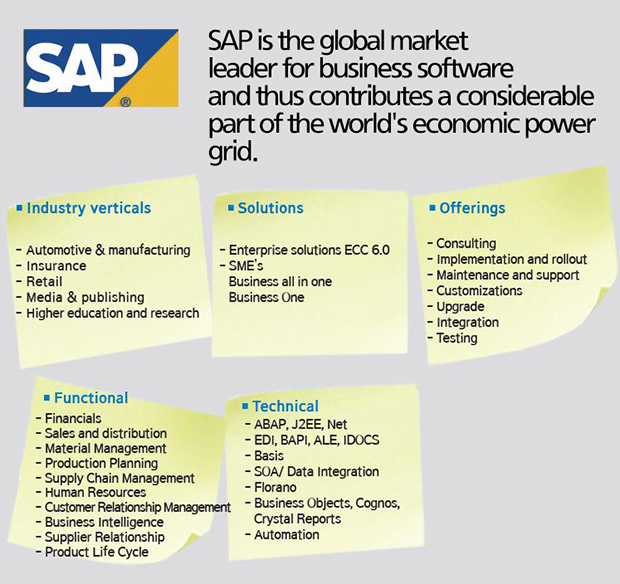 SAP is a German company, headquartered in Walldorf, Baden-Wurttemberg, Germany. I graduated from the School of Management Information Systems and received Bachelor of Business Administration from Kookmin University. It’s great to meet The Kookmin Review, as I was an enthusiastic reader of Kookmin Tribune (The Kookmin Review’s former name) when I was a university undergraduate. My job title is Senior Presales Specialist in Sustainability Solution SAP. I analyze and research the competitive market situation and customer’s requirements. You may not be familiar with the term Presales. Presales is basically supporting and informing the Sales of the firm. SAP’s business model is providing the best corporate software to customers and enabling clients to achieve their short and long term business objectives. This is achieved by providing them with the best of breed information technology solutions. The Presales Specialists help the Sales’ understanding of expert knowledge, product function and value of the software. This process of Sales is specialized for each industry, field and study. For example, one expert is specialized in high technology, while the other is specialized in Environmental Science. We support Sales with knowledge and the best understanding in the area. I specialize in two areas: EHSM (Environmental Health and Safety Management) and GRC (Governance Risk and Compliance). What core competency is required in Business solution & consulting field? The problem solving ability is the most required competency in solution consulting field. Solution vendors and consulting firms need to figure out customer needs, customer’s problem and actually solve the problem for clients. So basically, we want a good problem solver. Our job is to eliminate any of the causes which distract client’s organizational growth. Second of all, understanding customer’s situation from customer’s perspective is one of the highly required skills in the field. Students believe that MA or PhD is highly required to be a consultant. Is this true? If I tell you dare, it’s not a requirement. There are many employees with potential and capability even without MA or PhD. However, if you want to be a specialist or expert in the field, higher education is recommended as you need professional competency. For example, if the company posts a job opening, we state that MA or MBA is preferred. Studying more about the field that you are interested in for a longer period always leads to successful result. When I made a significant decision in my life, which was to attend a graduate school, I truly focused myself on the study as I had a passion and ambition to be a real specialist in the field. As a result, I was able to get opportunities. What is your advice to college undergraduates or soon-to-be graduates? To begin with, I would like to give advice to students as a senior in life ? do not build your own limits. The regretful statements such as “I could not have achieved it”, “It’s too difficult for people like me” are just excuses to yourself. To be straight forward, I recognized that most students in Kookmin University are feeling victimized with some negativity in their minds. Students should stop whining and do something else to come out of victim’s mentality. I have seen some students who did not even apply for multinational companies like SAP. Why not? Just give it a try! There’s nothing to lose. Second of all, I believe that highlighting one’s strength is better than making up for the weak points. Last but not least, always be enthusiastic and show enthusiastic attitude. Always lean in, and then you will win. I was astonished by the term 10 specifications required for an undergraduate to look for a job. If all university undergraduates have 10 specifications, it would mean that they are all same, not being special. From an employment perspective, having a unique experience is important. You need to set the target and objectives of your own and work on it. Following what others do is wasting your valuable time. Find what you want, then focus on it. I understand that it is hard for students these days to build their own special stories. But differentiating yourself from others is truly essential these days. Build up your individual competency. As a result, you will find the answer. There’s nothing much to say about the importance of English proficiency in the globalized world of the 21st century. If you have a limited English proficiency, you are not competent. Companies interview the applicants in English. We talk in English during working hours, making video calls in English and participating in town hall meetings in English with employees in Germany. I recognized that the intention to improve English pronunciation actually decelerates the growth of English proficiency for Korean students. If you can communicate well with the right expression of your opinion, pronunciation and nuance is not the major problem. There are Indian English, Malaysian English and Singaporean English. Please spend more time on developing expression skills than on pronunciation. I would like to tell a proverb to the student readers of The Kookmin Review: let’s assume that you have a pot to be filled in with big stones, medium sized pebbles and fine sand in order to achieve success in your life. To fulfill the pot with as many things as possible, the best way would be putting the large stones first, secondly putting the pebbles, and lastly pouring the fine sand on the top. In this case, the big stone is your English ability. I firmly believe that English fluency is the most important and the basic ability, which would enable your success. SAP is a multinational company, having Institutes, offices all over the world. We welcome global talents. Foreign students are more than welcomed. Please have confidence and challenge yourself.